S League: Below are the results of the games played in the final round of the 43rdKisei S League. 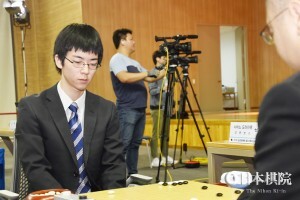 On September 13, Takao Shinji 9P (B) beat Yamashita Keigo 9P by half a point. On September 17, Ichiriki Ryo 8P beat Kyo Kagen Gosei by resig. and Kono Rin 9P (B) beat Cho U 9P by 1.5 points. 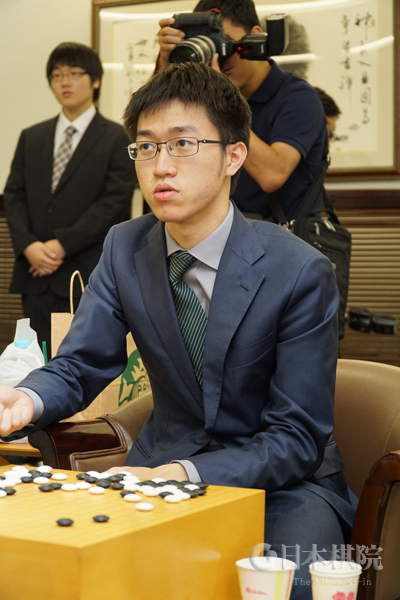 Yamashita had already clinched victory in the league in the fourth round, so this loss did not hurt him. However, Kyo Kagen’s loss was painful, as it meant ceding second place to Kono. 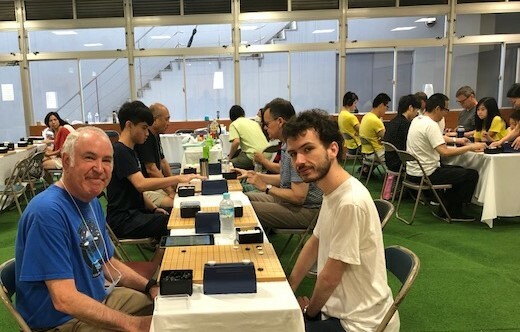 There are no play-offs in the Kisei leagues: ranking takes precedence, so Kono qualifies for the final stage (see below). The bottom two players will drop to the A League. A League: Murakawa Daisuke 8P took first place in the A League, which has eight members. 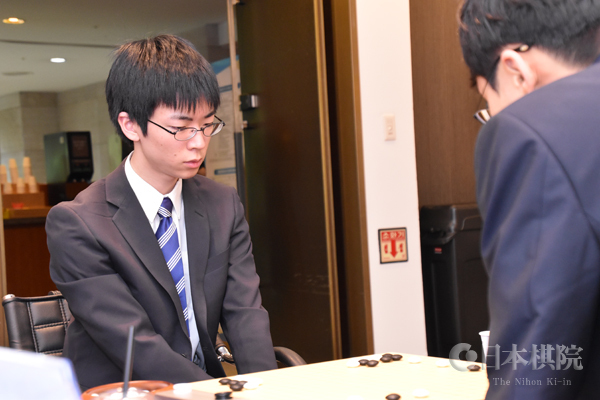 Actually, he “tied” with three other players on 5-2—they were So Yokoku 9P, Yo Seiki 7P, and Shida Tatsuya 7P—but his number one ranking gave him precedence. 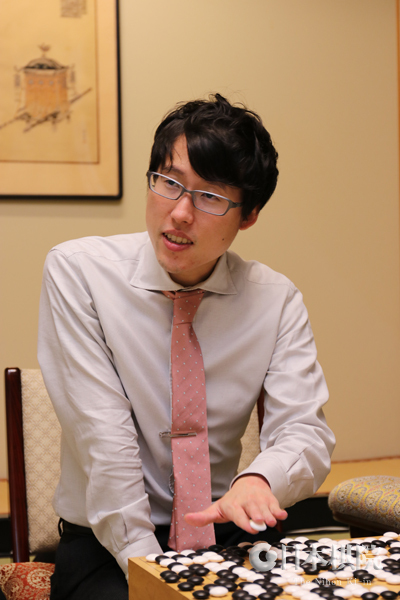 Murakawa and Yo will be promoted to the S League in the next term (assuming the former does not become Kisei). B Leagues: There are two B Leagues, each with eight members. 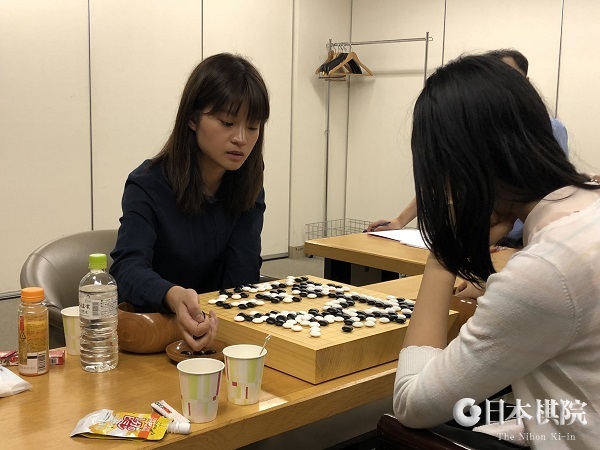 A play-off was held on September 17, and Shibano Toramaru 7P (B2 winner on 7-0) (W) beat Akiyama Jiro 9P (B1 winner on 5-2) by resig. C League: The C League is like a tournament in its own right: it has 32 players and is run by the Swiss System. Onishi Ryohei 3P won it 5-0. Tournament to decide the Kisei challenger: The league winners above will participate in an irregular knock-out tournament to decide the challenger to Iyama Yuta. It works as follows: Onishi plays Shibano, the winner plays Murakawa, the winner plays Kono, and the winner plays Yamashita. The final with Yamashita is a “best-of-three” in which three games will never be played. 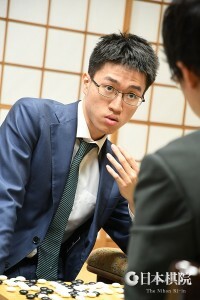 The reason is that Yamashita will start off with a one-win advantage, so his opponent has to win two in a row. Otherwise, what would be the point of winning the top League? In theory, though, any of the 62 players in any of the five leagues could become Kisei, so it’s thought that professionals feel more incentive than with the former system. 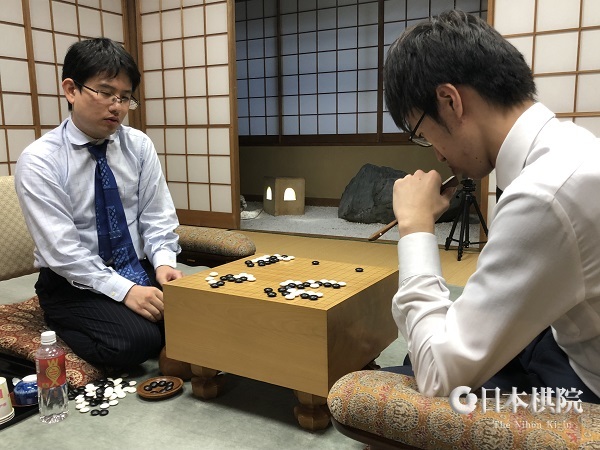 Yamashita-Iyama pairing in Tengen sets new record: In my previous report, I noted that Yamashita Keigo had become the challenger to Iyama Yuta for the Tengen title. Subsequently, Go Weekly pointed out that this will be the 11th title match between these two, which sets a new record. So far, Iyama has lost only once. 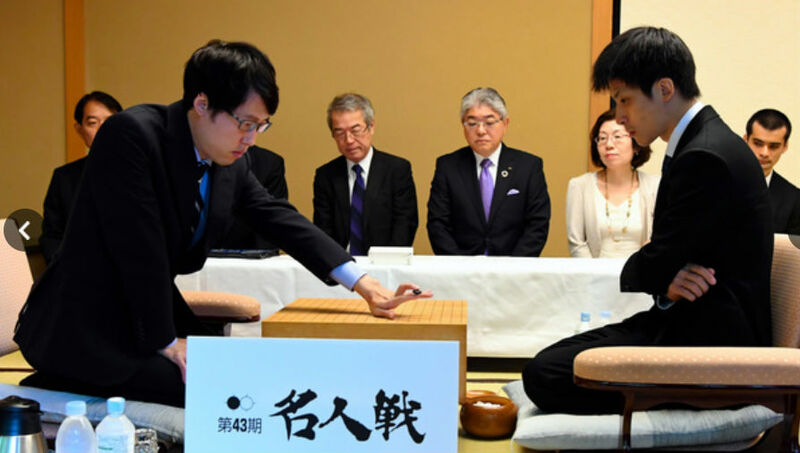 The previous record was ten, shared among three players in two pairings: Cho Chikun (eight wins) v. Kobayashi Koichi and Kobayashi Koichi (six) v. Kato Masao. 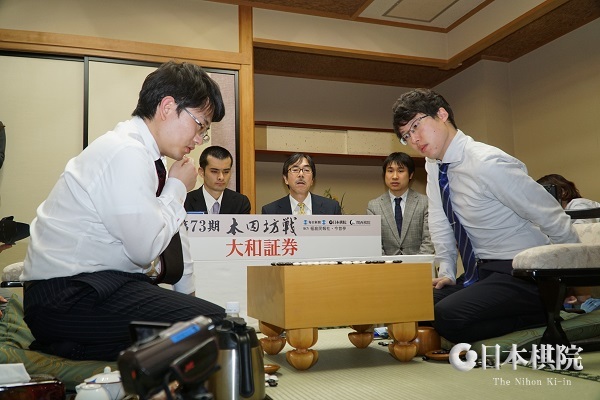 Next is the current Meijin title match, which is the ninth match between Iyama (six) and Cho U. Equal fourth is Cho Chikun (seven) v. Otake Hideo. 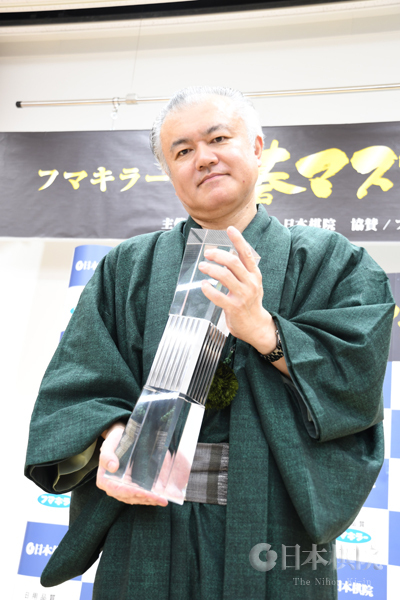 The Power Report (3 of 3): Yamashita wins Kisei S League; New Pair Go World Champion Pair; Iyama starts Meijin defense with a win; Yamashita to challenge for Tengen title; Fujisawa to challenge for Women’s Honinbo; Promotions; Nakayama the most prolific go writer? 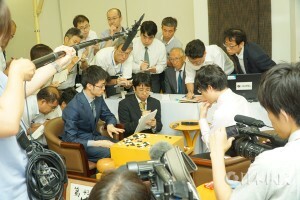 Yamashita wins Kisei S League: Two games in the 43rdKisei S League were played on July 9. Yamashita Keigo 9P (B) beat Ichiriki Ryo 8P by resig. and Takao Shinji 9P (W) beat Cho U 9P by half a point. 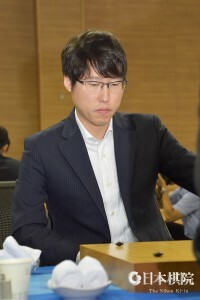 On 4-0, Yamashita was the only unbeaten player; there is no play-off in ties in this league, so Yamashita won the league regardless of his result in the fifth and final round. In the running for second place—and a place in the knockout tournament to decide the challenger–were Kono Rin 9P and Kyo Kagen Gosei, who were both on 2-1. They played each other on August 30. Taking white, Kyo won by resignation. This gives him provisional second place. 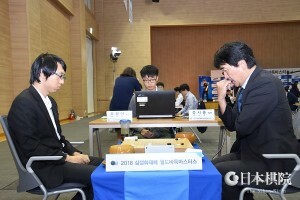 If he loses his final game, the winner of a game between Kono and Takao Shinji will edge him out, as both are ranked higher in the league. In contrast to the Meijin League, in which he won all his games, Cho U has lost all his games; on 0-4, he can’t hope to avoid demotion. 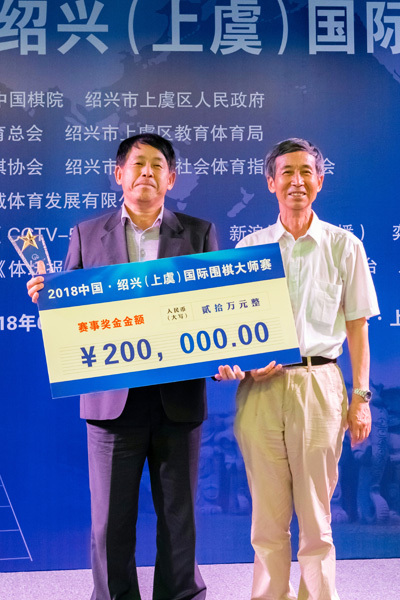 New Pair Go World Champion Pair: In 2016, a Pair Go World Cup was held and was won by the Chinese team of Yu Zhiying 5P and Ke Jie 9P. Last year, a World Championship was held in two stages. 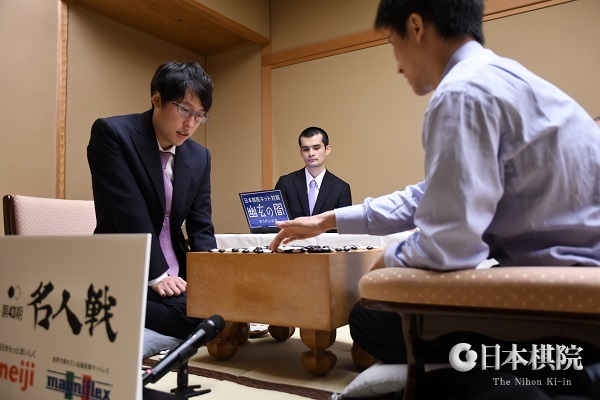 The first part was a tournament to decide the pair to challenge the reigning world champion pair of Yu and Ke. The Chinese pair defended their title. This year another world championship was held, but with a different result. 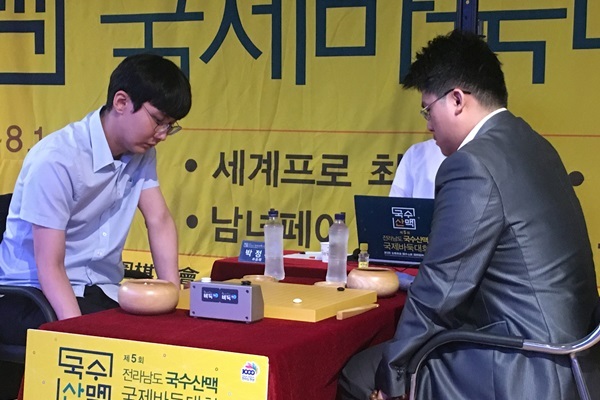 The first stage, held on August 20 and 21, was won by the Korean team of Choi Jeong 9P and Park Junghwan 9-dan. They won their challenge to the Yu/Ke pair and so now reign as the Pair Go World Champion Pair. 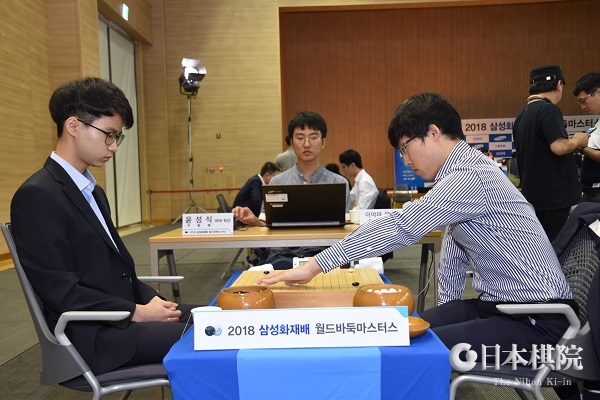 Taking black, Choi and Park won by resignation after 183 moves. 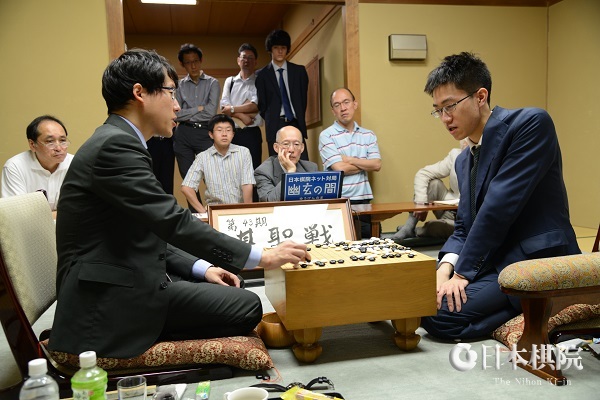 Iyama starts Meijin defense with a win: The first game of the 43rd Meijin title match was held at the Hotel Chinzanso Tokyo on August 28 and 29. Taking black, Iyama Yuta made a good start to his defence, forcing the challenger Cho U 9P to resign after 239 moves. In a variation of a recently popular “joseki,” a massive ko fight (worth 45 points) started. 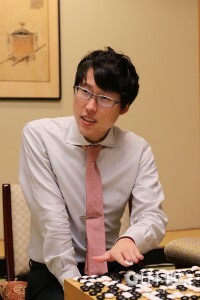 With move 81, Iyama ignored his opponent’s ko threat and finished off the ko, but ceding the ko was also feasible, as in exchange Black would have got a large-scale attack on White. Next, an enormous fight started on the other side of the board, featuring two more large ko fights. White suffered further damage in one of these fights and, although he managed to wall off a large territory, he was unable to match Black on territory. The second game will be played on September 12 and 13. 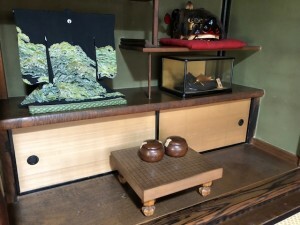 Yamashita to challenge for Tengen title: Not everything is going smoothly for Kyo Kagen, the new holder of the Gosei title. The play-off to decide the challenger for the 44thTengen title was held at the Nihon Ki-in on September 3. 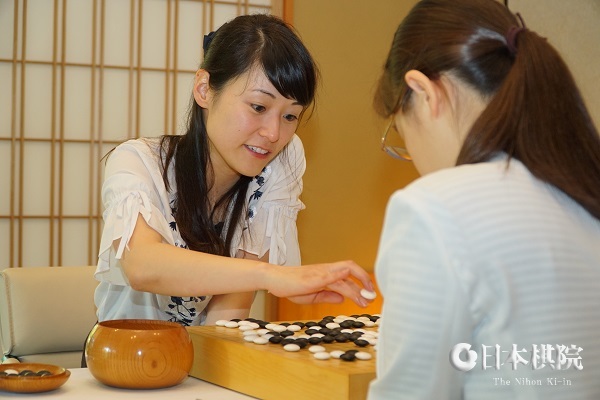 Playing white, Yamashita Keigo 9P beat Kyo by resignation after 226 moves. Yamashita turned 40 three days later, so he is nearly twice Kyo’s age. This will be Yamashita’s first appearance in the Tengen title match since the 36thTengen in 2009. He won the 30thand 35thtitles. The match with Iyama Yuta will start on October 19. Fujisawa to challenge for Women’s Honinbo: Fujisawa Rina has a chance to take back the title she lost to Xie Yimin last year. 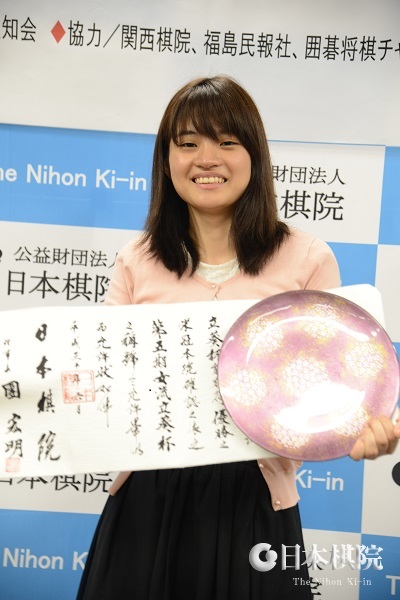 In the play-off to decide the challenger for the 37th Women’s Honinbo Title, held at the Nihon Ki-in on September 6, she beat Ueno Asami (B) by resignation. The title match will start on October 16. Nakayama the most prolific go writer? In the August 21 issue of this journal, Kent Olsen expressed interest in the number of books Nakayama Noriyuki had written. I have no way of doing a count, but I do recall a conversation decades ago in which Nakayama mentioned that he had already written over 200 go books. 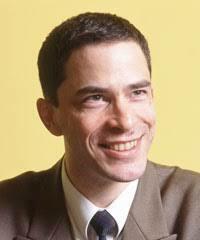 He added that publishers liked him because, if required, he could write a book over a weekend. Some of his books would have been published under the names of top professionals, with the actual writer getting a credit as “writer” or “editor” or sometimes not being mentioned at all. Michael Redmond will visit the National Go Center the second week in September, with a full schedule of commentaries, simuls and other appearances; stay tuned for further details soon.